Kafka Connect (or Connect API) is a framework to import/export data from/to other systems and it internally uses the Producer and Consumer API. The Connect API defines the programming interface which is implemented to build a concrete connector which has actual logic to read/write data from other system. These other system can be Databases, Couchbase, Sap, HANA, Blockchain, Cassandra, FTP, Twitter, etc. Kafka connect API includes both Producer API (for Source -> Kafka) and Consumer API (for Kafka -> Sink). Like Kafka cluster consists of multiple brokers, Kafka connect cluster is collection of workers (Servers). Standalone mode: Single process runs our connectors and tasks(Connectors + User configuration => Task). Configuration is bundled with processes. Its easy to get started but not fault tolerant and no scalability. Distributed mode: multiple workers run our connectors and tanks. Configuration is submitted using REST API. Scalable and fault tolerant(rebalances on worker failure). 1. 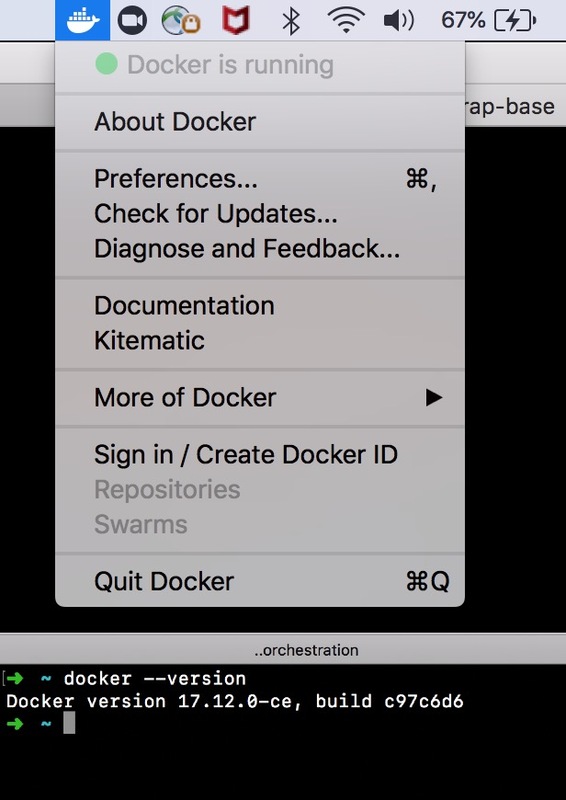 Refer this and install docker as per your operating system. I have installed docker in Mac and validate it is up and running. Start docker and wait for a moment to get started. 2. Create a file docker-compose.yml and copy & paste following configs in it. (Or download docker-compose.yml). # this is our kafka cluster. 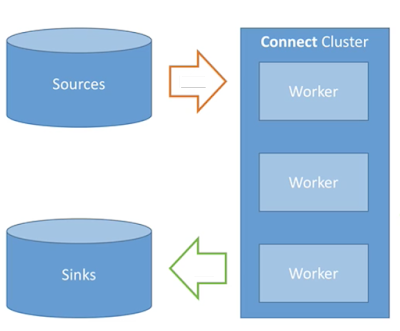 # we will use elasticsearch as one of our sinks. 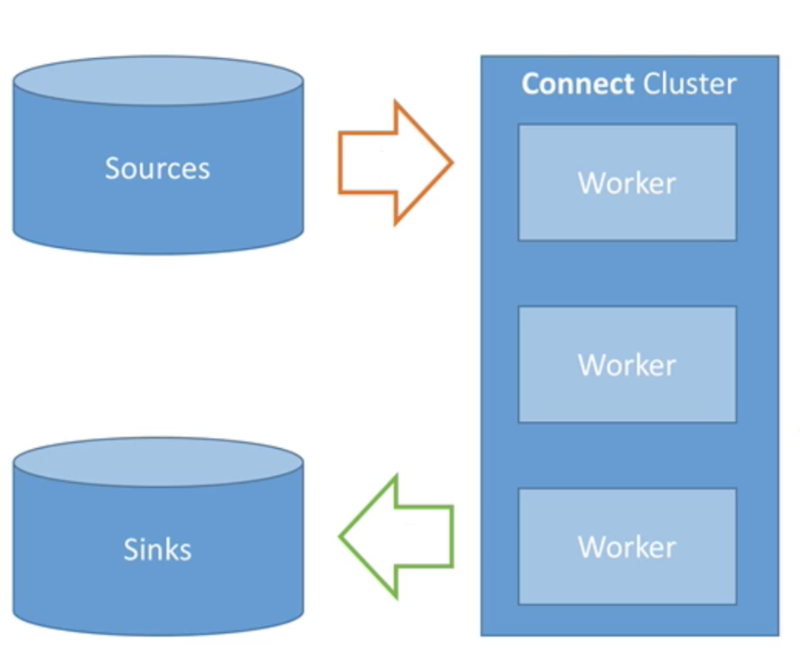 # we will use postgres as one of our sinks. kafka-cluster_1  | Setting advertised host to 127.0.0.1.
kafka-cluster_1  | This is landoop’s fast-data-dev. Kafka 0.11.0.0, Confluent OSS 3.3.0.
kafka-cluster_1  | You may visit http://127.0.0.1:3030 in about a minute. Open browser and check Landoop fast-data-dev services is running. 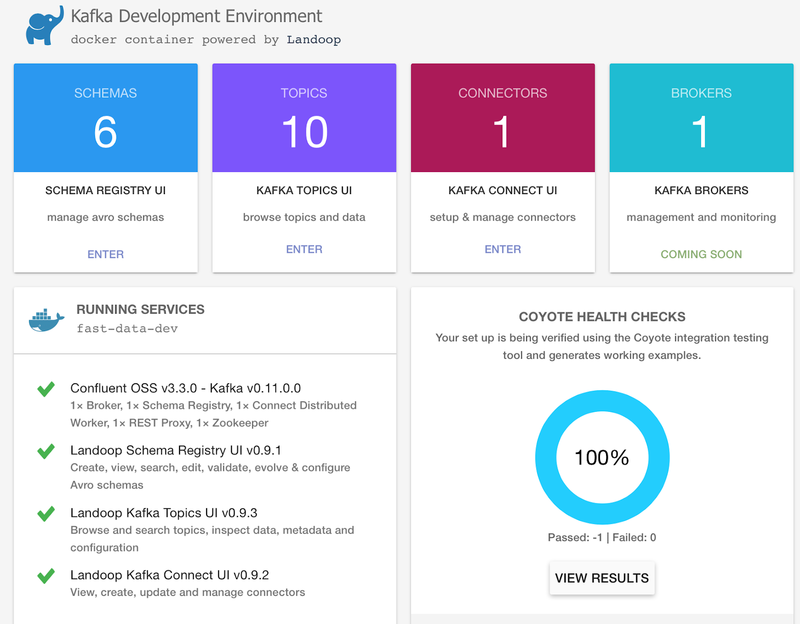 This UI provides an overview of Kafka cluster with topic and broker insights. Standalone mode is best way to get started with minimum config and infrastructure setup. In this section we will see how to configure a connector in Standalone mode and transfer file content to Kafka topic. Step-1: Create two files: workers-config.properties and file-stream-connector-properties. I am creating these files under directory /Users/n0r0082/Kafka/Kafka-connect where docker-compose.yml was created. Step-2:Create an input file source-input.txt, the content of the file is transferred to Kafka topic. Step-3: Mount a host directory in a docker container: Make sure we are in directory where we have created 2 config file and 1 source file. After mount we automatically switch to fast-data-dev shell. Step-4: Create Kafka topic "kafka-connect-standalone" with 3 partition and replication factor 1. Topic created can be validated form in browser at address http://127.0.0.1:3030/kafka-topics-ui/#/. Create standalone connector using workers-config.properties and file-stream-connector-properties. Step-6: Action time, Open file source-input.txt and type some message to it & save it. Message should have been transferred to Kafka topic. Open http://127.0.0.1:3030/kafka-topics-ui and monitor topic. We should receive message what we wrote in source-input.txt. What happened in background: We wrote data to source file and Kafka connect standalone pushed the data to topic. No programming just configs. !! What is significance of file standalone.offsets ? Stop Kafka Connect (press Ctrl/Command + C). Once Kafka connect gracefully stopped, list all files in given directory. We have a new guest in the form of a file "standalone.offsets". This file is created by Kafka connect to keep track of from where it should resume reading message from source file on re-starts. i.e: When Kafka connect starts again from where it should resume reading without publishing duplicate message to topic. Try to execute above command (connect-standalone workers-config.properties file-stream-connector-properties) again and validate in Kafka topic UI we do not have duplicate message.